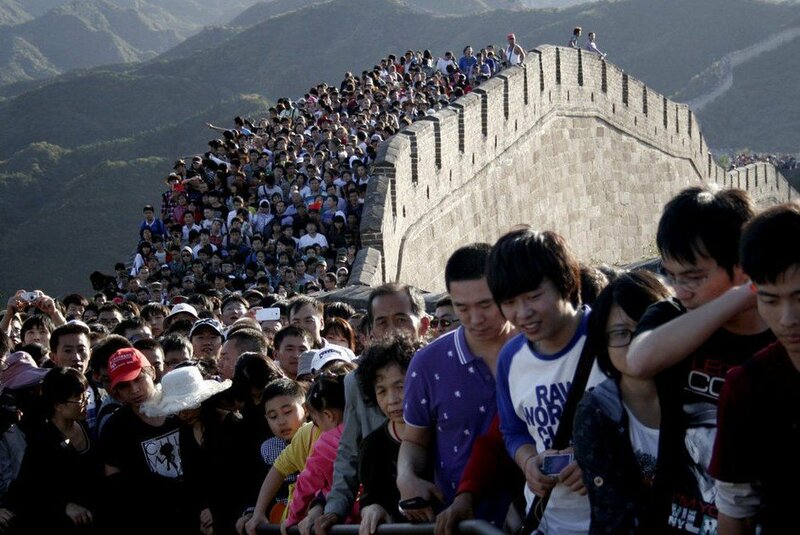 The Best Part and Best Time to visit Great Wall of China. - MisTan IzZy | Travel & Lifestyle. While planning for my trip to Beijing last June 2016, I have the whole must-see list in my plan, and Yes, who else would miss out visiting the Great Wall of China when you're in Beijing? We all know how crazy the local Chinese would be when comes to be a tourist right, so I am trying my best to escape from Chinese crowd as much as I can. Just take a look at the crowd, can you even imagine when you're in one of them??????! No wayyy, I'm not gonna let that happen to me! This Great Wall was built in the Ming Dynasty. The Ming Great Wall is officially 8,900 km (5,500 mi) long, and the most popular and well protected sections are around Beijing. The best time to visit is in Spring & Autumn, as you can avoid the heat & crowd in Summer, and winter freezing condition. Fall (September–November) is a the best hiking season due to the clear weather, allowing you to see the Great Wall snaking off into distance. The mountains are blanketed by colors of red, golden, yellow, and brown, which sets off the grays and paler Great Wall colors. Avoiding weekend & Public Holiday is the common thing to do. By looking at this map, you'll see those highlighted with a line, and those are nearby Beijing (Red Star) which you can visit while you're in Beijing. 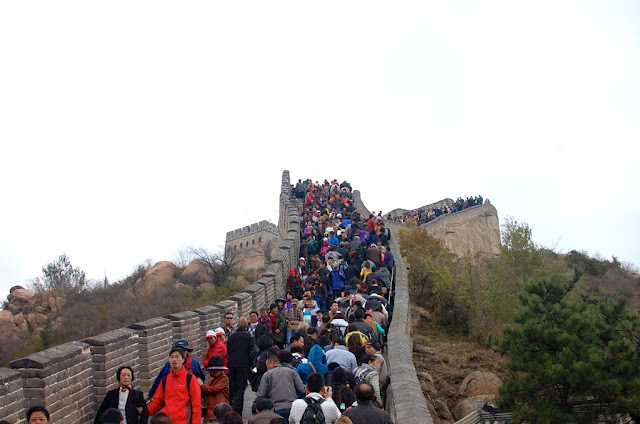 Nonetheless, the most popular part for tour groups are Badaling gate and Mutianyu gate, both are the nearest to Beijing, with most fully restore condition. Finding out about these 2 gates which are the most crowded part, immediately they are out from my choice. Then I came across about the two most popular Great Wall hiking trip which is quite far from downtown Beijing — it takes about 2 hours to get to the more beautiful, less-crowded sections, where you are suggested to take a hiking trip. If you would like to experience the steepest section, the Great Wall at Jiankou is the best choice for you. This section is wild Great Wall without cable cars or any new steps. Many of the Great Wall stairs are broken or crumbling, which makes this section more dangerous. This most popular hiking route follows the wall down to Mutianyu — a magnificently restored section. The Great Wall at Jinshanling is well preserved with many original features. It's considered the most beautiful section with the wall snaking along the mountain ridges and watchtowers of various designs. This section is part-restored with a cable car up to the restored wall, so you can save some energy descending at the end of the hike. The most popular hiking route is hiking from Simatai West to Jinshanling, doing the harder wild part first while you are fresh. When I read about these 2 routes, I went to search about Simatai & Jinshanling, since this is my first time, I didn't want to go too extreme, so I choose the moderate one :) Indeed, I've never regret about my choice! 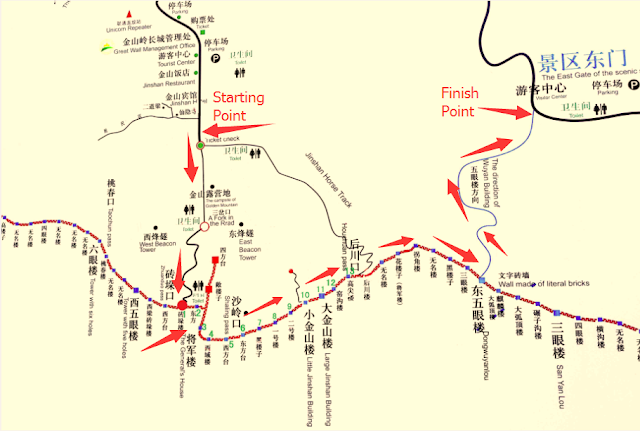 My hike starts from Jinshanling to Simatai, about 10km and 4 hours in total. FYI, I book a private car instead of tour because I heard too many bad review about China Local Tours, so I would rather pay more to get myself some real relaxing time. Basically this is the whole route I am hiking, from the starting point, and crossing those watchtower and detour at DongWuYan watchtower to the exit. This is the part from the starting point where they did some touch up on the Great Wall. - bring as much water as you can, I regret for not listening to my driver. I thought I wouldn't need much water because I don't want to look for toilet on the half way, but NO, I was so WRONG! If you didn't want to carry so heavily, you can still purchase drink along the way from local sellers. - wear a pair of nice sports shoes, remember, that's a 10km long pathway with many staircase. Look at this great structure, I am adore by the works of the people from centuries back, they have the greatest wisdom! You can see from the picture itself, half of the structure has been destroyed, but still remain walkable. I would rather walk through a real Great Wall than the one that has been fully repair. And yes, I made it till the end within the time frame! If you are looking to book a private car, do not hesitate to contact Paul. OMG SO NICE! you're lucky to take amazing shots with no one around. The last time i went it was crazy packed! Wow !! Nice guide ..i wish i go there one day...i agree with you that rather to explore the original great wall than the restore one.. I never visit Great Wall of China. I think I should to see the greatest achievement of mankind. Miss the moment at The Great Wall last year. Summer is quite crowded, maybe will revisit there during winter if got chance.